Did you know that visitors to the festival last year drank over 250,000 pints of Guinness? That was probably helped by over 10,000 Irish racing fans who made the trip over the Irish sea to celebrate two Irish favourites: the Cheltenham Festival and St Patrick’s Day. It’s not just Guinness that gets drunk to excess, with over 120,000 bottles of wine downed during the Festival, including 20,000 bottles of champagne. That was only possible because of over 5 furlongs of temporary drinks counters in force at the Festival. The amount of money being bet at the Festival is just as staggering, with more than £600,000,000 reported to have been wagered during last year’s Festival. That makes total prize money of over £4,000,000 pale into insignificance. Going back to the racing, and the most successful horse at the Festival isn’t Best Mate, Istabraq or Dawn Run, but is actually Quevega - who won a remarkable 6 consecutive victories in the Mares Hurdle. Golden Miller won 5 consecutive Gold Cups in the 1930s, while Pat Taffe won 4 Gold Cups in his career - the most of any jockey. Jack Kennedy won the Supreme last year at the tender age of just 17, but surprisingly he isn’t the youngest jockey to bag a winner at the Festival, with Bruce Hobbs winning at a few days younger in 1928. Records are there to be broken, so will we see any new ground being trodden in 2018? The stage was set in 2015 for the first day of the Cheltenham Festival, with Willie Mullins and his high-powered team looking for another successful festival after having dominated with Ruby Walsh in previous years. This year, his opening day lineup, in particular, looked able and willing to dominate the field, with the Mullins/Walsh combo responsible for not one short-priced favourite, not two, but the first FOUR favourites in the non-handicap races of the prestigious ‘Greatest Show on Turf’. The punters were ready to back the trusted combination and were willing to do so in big numbers, with horse racing betting sites reported to have been preparing themselves for a loss of an unbelievable £20 million if those four first day favourites were to come home. Douvan duly did the business in the opener, the Supreme Novices Hurdle, before Un De Sceaux made it two-for-two in the Arkle with a convincing win. More was yet to come, with Faugheen ‘The Machine’ coming into the Champion Hurdle with plenty of hype, and he delivered to leave the bookmakers squirming with just the Mares’ Hurdle to come. Annie Power was the shortest-priced favourite of the day, a 4/7 shot to win having shown she was capable of mixing it with the best male horses in festivals in the past. It looked like she would deliver, too, as she made all before coming to the final hurdle. It’s fair to say that the frenzy that was building around Prestbury Park was completely wiped out, and the bookmakers left the first day down, but far from out after their reprieve in the OLBG Mares Hurdle. Horse racing might be known as the ‘sport of kings’ but that doesn’t mean it doesn’t draw its share of lewd behaviour, especially during the festival where bumper crowds mean queues for the bar, and for the toilets, can get a bit too much for some people. Just ask the trio of English footballers spotted at Cheltenham in 2016. MK Dons midfielder, Samir Carruthers, was pictured relieving himself into his empty beer glass - clearly, the excitement of the next race was just too much to miss, while Bristol City defender Luke Ayling joined him in the ceremony before placing his glass precariously above a public walkway! It doesn’t get any better, perhaps James Collins of Northampton had lost some of his inflated footballer’s wages with some misplaced bets? Whatever the reason, he decided to throw his freshly filled glass over the fans below him. Hardly the behaviour of the gentlemen expected at the Festival! It doesn’t stop with the boys either, after Love Island pair Jessica Hayes and Katie Salmon, were pictured flashing on Ladies Day, and were subsequently banned for life. Please, if you are attending the Festival this year, don’t get any ideas from those bad celebrities! Lord Windermere is perhaps one of the most famous Gold Cup-winning horses. He wasn’t a star, and though he has that Gold Cup, as well as a Ryanair Chase, to his name, Lord Windermere will certainly not go down in Cheltenham history amongst the legends of the sport. His win was famous not just for coming at a bold price of 20/1, but for the manner of his victory which left a sour taste in the mouth for many, especially those that had backed On His Own. The simple result was a victory for Lord Windermere by a short head from On His Own, but that result only came after a 15-minute stewards enquiry, with a large number of pundits and experts questioning the decision. The source of the controversy was the run in, as Lord Windermere seemed to swerve and impede On His Own, something that, on any other race day at your local track, would have led to a reversal of the result, especially when the final margin was as small as it was. Instead, the result stood, and from a position at the rear of the field with no chance halfway through the race, Lord Windermere had prevailed in the most unlikely of manners to win the most coveted race at the Cheltenham Festival. With the Cheltenham Festival the showpiece event of the National Hunt season, there is always plenty of money being placed even several months before a race is due to start. In 2010, there was big interest in Binocular for the Champion Hurdle. Nicky Henderson’s charge had finished in third the season before, and with the trainer having a great record in this race with four previous winners, there was plenty of support for Binocular. So the news of his withdrawal a month before the race came as a shock and disappointment for many. Some tore up their tickets as his price rose to a maximum of 999/1 with betting exchange Betfair​​. Those who had ripped up their betting slips in disappointment would have been aghast to see Binocular back in the lineup at the last minute, as, seemingly by a miracle, the muscle problem that had originally led to his scratch had been healed and he was ready to go. To make matters worse, Binocular went ahead and won the race, leaving many fans scratching their heads, and other looking for the Sellotape and the hundred pieces of bet slip in the bin. Fast forward to 2016, and the big question being asked by many punters was which race would Rich Ricci choose for Vautour. A star horse who would surely tear up the field in the Ryanair, or could have equally had a decent chance of Gold Cup success - the ultimate prize at Cheltenham - Vautour’s options were a seemingly simple victory or a bold attempt at the grand prize. Looking for tips as to which way to bet, punters were swayed by the assertion from Ricci himself that for Vautour it was the Gold Cup or “stay at home”. At the same time as the money subsequently came in for Vautour to win the Gold Cup, bets were placed for alternative horses in the Ryanair, under the impression that the most impressive horse in the field wouldn’t turn up, and at prices based on Vautour not running. So, when Ricci pulled his star horse from the showpiece event in favour of the Ryanair, you can understand the anger and frustration from punters all over the country. Ricci apologised, but it was too late for some punters, who had already lost their money or taken bad prices on others in the Ryanair. 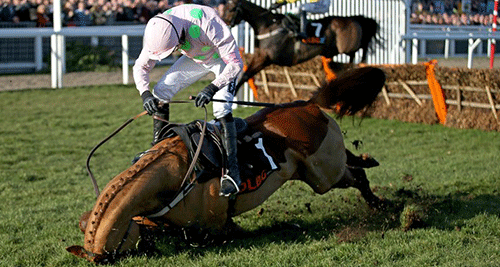 The frustration was only compounded when Vautour stormed to a comprehensive victory in the Ryanair. Who knows what might have been had Ricci stuck to his word, but there were plenty of angry fans who were certainly much worse off. If Lord Windermere’s success was a surprise at the Gold Cup in 2014, then the win for Norton’s Coin in 1990 can only be described as unbelievable. Norton’s Coin was the rank outsider that year, with a starting price of 100/1, well behind the likes of the legendary, Desert Orchid, at that time 11 years old. There was only a single horse in the 12 strong field less fancied, and there were few inside Prestbury Park that were celebrating when Norton’s Coin ran up the hill to win by ¾ of a length from Toby Tobias, with Desert Orchid back in third. That win is the longest odds victory in the history of the Cheltenham Gold Cup, and just the second Welsh-trained winner of the big race, under the tutelage of Carmarthen dairy farmer Sirrell Griffiths, who had originally wanted to enter Norton’s Coin in one of the valuable handicaps. Griffiths missed the deadline, entered his charge into the Gold Cup at the expense of £1000, and made history having only hoped to regain his entry fee with a top six finish. Not only did Norton’s Coin win the Gold Cup, but he broke the course record in the process. A betting tip for when you’re making your Cheltenham bets this year: think of Norton’s Coin before you write off the big odds underdogs. Keep up with all the news and read up on Cheltenham facts and stats ahead of the 2018 race!